The lack of diversity in PR is an issue that has persisted over the years. And while firms and corporations are devoting more resources to expanding their multicultural employee base, there is still much that needs to be done. The lack of diversity in PR is an issue that has persisted over the years. And while firms and corporations are devoting more resources to expanding their multicultural employee base, there is still much that needs to be done, according to the 2007 PRWeek/Hill & Knowlton Diversity Survey. In recent years, most every aspect of American culture has begun to reflect the nation's shifting demographics. In popular music and fashion, food preferences, even politics, the influence of diverse ethnicities, cultures, and points of view can be seen. "We all know the US is becoming much more of a melting pot," says MaryLee Sachs, chairman of Hill & Knowlton USA. Why, then, she asks, does the PR industry remain a step behind? To address that question, the fifth annual PRWeek/Hill & Knowlton Diversity Survey again polled PR and HR executives to examine the state of diversity in their own firms and corporate communications departments. And if responses to this year's survey are an accurate indication, Sachs is but one of many PR pros in search of an answer. The survey polled 139 agency practitioners and 111 communications pros from corporations or private companies. According to the results, 49.5% of PR pros working in corporate communications - and 60.4% of those on the agency side - feel the PR industry "has a problem with lack of diversity" in the workforce. While that may seem disheartening, the majority of respondents say, too, that "the commitment of senior management to taking action" is high. Still, Sachs says, "We're not seeing a lot of change." The disconnect between action and outcome likely lies in the industry's traditional approaches to workforce diversification, says Greg Waldron, partner and chief talent officer at Porter Novelli. Agencies and corporations alike have long relied on sensitivity training workshops and diversity councils to get results, he says. But because those kinds of programs are "sort of this artificial tack-on to the real business of the organization," he explains, "[they] really have not had a lot of lasting results, and therefore staying power." What's needed, Waldron says, "is very practical training, training around getting results, using a different, more effective way." Like many survey respondents, Waldron notes that the industry could also do a far better job of "educating kids as to what PR is all about," beginning in high school or even earlier. "It isn't about handing out tsotchkes in shopping malls," he says. Diverse populations don't necessarily "talk about PR as a career," adds Scott Pansky, partner and cofounder of LA-based Allison & Partners. "They don't necessarily understand from the [start] what we do... what PR really is, how it's done from a strategic level." 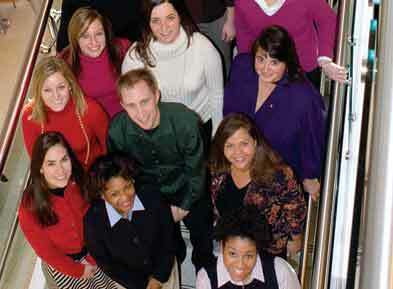 To help, the firm encourages its employees to teach classes and participate in PRSSA activities. In addition, Pansky says, the agency's San Diego office hosts an internship program with charter school High Tech High, to "take kids in and teach them about PR." Whether it begins in high school or college, survey respondents agree that the industry could do a better job of early, sustained outreach to students of diverse backgrounds. To that end, bolstering relationships with colleges and universities with diverse student populations has become a priority for agencies and corporate communications departments alike. For all its efforts, says Sachs, "the PR profession hasn't done a good enough job with higher learning." Survey numbers back that up: Incredibly, 40.3% of agency executives surveyed - and 59.5% of those on the corporate side - reported their businesses do not look to schools "for recruitment of an ethnically diverse range of candidates." Those that do, however, are stepping up outreach to universities with ethnically diverse populations. Corporate outreach to these schools, in fact, has seen a significant jump, from 33.6% in 2006 to 43.2% this year. Among respondents representing PR firms, 46% reported that they reach out to ethnically diverse colleges and associations, as opposed to 38.5% in 2006. Sachs says that's a step in the right direction, but believes even more can - and should - be done. For example, she says PR pros should establish more direct connections with academics themselves, as they are the "gateway to the students." "It doesn't take [much] to add an extra hour for a meeting with an academic," she explains. Earlier this year, one of those "extra hours" translated into action for New York-based Taylor. When agency CEO Tony Signore learned from Rochelle Ford, associate dean of research and academic affairs at Howard University's John H. Johnson School of Communications, about the challenges her multicultural students faced when entering the real-world job market, he rallied his staffers to make a difference. "We wanted to do our part, to set a good example," says Taylor managing partner Erin Weinberg. "At the end of the day, these students just wanted an opportunity." That initial conversation led to the creation of Taylor's Historically Black Colleges and Universities (HBCU) Public Relations Challenge, in which college seniors majoring in PR and communications were tasked with developing and implementing a three-month campaign to generate positive awareness of the efforts of local Boys & Girls Club of America volunteers. HBCU faculty and administrators nominated more than 2,000 students, according to Weinberg. And the Challenge winner - now a graduate of Florida A&M University - earned a full-time AAE post in the firm's New York office. Efforts such as this benefit everyone involved, PR pros say. Not only do they help expose diverse students to the industry, but they serve as a great way to identify and recruit new talent. As well as reaching out to schools with ethnically diverse populations and hosting internship programs, survey respondents report that other common activities taken to increase ethnic diversity in the PR/communications workplace include hiring recruitment/HR staff from ethnically diverse populations and speaking to audiences of professional groups, such as the National Association of Black Journalists (NABJ). H&K has employed such tactics in its diversity outreach, sponsoring events at conferences and hosting meetings for such groups as the Black PR Society, NABJ, Tampa Association of Black Journalists, and Hispanic PR Association. At Allstate Insurance in Northbrook, IL, the communications department - like all company divisions - has long been invested "in forming strong relationships with a lot of universities, as well as partnering with mainstream and minority and female organizations," says Anise Wiley-Little, Allstate's assistant VP and chief diversity officer. That includes HBCUs, and groups such as the National Black MBA Association, the Hispanic MBA Association, the NAACP, and the National Urban League. Diversification - and "making sure every voice is valued and heard" - is more than just a nice idea, Wiley-Little notes. It's also a business proposition. "It was always important for us [to] look ahead and to look at our competition," she explains. "And very clearly when we look at our workplace and marketplace, we could see that it was changing... The things we do when it comes to inclusion and diversity are not just about today, but to prepare and sustain us for the future." Keeping an eye toward the future is the answer to what may be the most important question for any entity struggling with efforts to diversify its employee roster. But it shouldn't be the only one. "What's the business case for diversity in PR?" asks Denise Gordon, US director of HR at H&K. "We need help answering that." Whatever the reason, it's imperative to have one, says Ric Powell, managing partner of Cincinnati-based Accel Advisors, a diversity consultancy. In many cases, "multicultural investments are ad hoc and under-funded," Powell says. That's a dangerous combination, he adds, one which propagates a cycle of minimal and mediocre returns, a tightening of resources, then smaller and smaller investments. Often, Powell says, when he asks clients "why [diversification] is important and what does it mean to the business... you either get a very high-level, philanthropic, 'It's the right thing to do' response that lacks measurement, or you get a blank stare." Until there is a clear strategy to tie employee-diversity objectives to business objectives, "it's not going to work," he adds. This year's survey reveals that, among corporate-side respondents, the most important business reasons for employing an ethnically diverse workforce include "to ensure the company produces relevant products/services for an ethnically diverse population" (56.8%), "to help the company market its products/services to an ethnically diverse population" (31.5%), and "to better reflect the balance of the general population"(29.7%). Only 7.2% cited "to improve the financial performance of my company." On the agency side, reasons cited as most important for employing an ethnically diverse workforce include "to reflect the diversity of the population" (36%), "to enhance the agency's reputation as an employer" (28.8%), "to pitch for multicultural accounts" (28.1%), and "to develop programs for diverse populations" (24.5%). For an industry that revolves around distributing messages to a diverse group of consumers, this shouldn't be a surprise. But workplace diversification means more than expanding multicultural practices, keeping each ethnic group in segregated PR ghettos. Indeed, agencies specializing in African-American, Hispanic, and Asian-Pacific Rim PR may be among the fastest-growing areas of industry development, "but everyone has their own group and stays within it," adds Joann Killeen, president of LA-based Killeen Furtney Group and former national PRSA president. "We all practice PR, we're all qualified people. Why is everyone still in their own group?" Incorporating diversity into its overall practice is a goal Burson-Marsteller sought to meet this year with a major initiative, says Celia Berk, MD of worldwide HR. "We set out to bring our internal work around diversity and external work around multiculturalism together," she explains. Created with funding from parent companies WPP and Y&R, and launched in mid-November, Burson's internal networking initiative gives all staffers a chance to assist in employee recruitment and mentoring, Berk says. Not only does this "culture of inclusion" approach display that every employee has something to offer, but it also allows Burson to "position ourselves [as] a firm that can help clients understand diverse categories," she notes. It also allows the agency to be "much more micro-targeted" when working with clients to reach specific communities. "If you want credibility," Berk says, "you need an employee base that looks like the communities you want to communicate with." Maintaining a diverse staff, however, is another matter entirely. While retention is a huge issue for employees of all backgrounds, for people of color, H&K's Gordon says, it's even more of a challenge - especially when diverse recruitment efforts are focused on less-senior posts. When diverse employees "look up and don't see anyone like them, they automatically feel [separate]," Gordon says. According to the survey, some PR pros feel ongoing retention activities - competitive salaries, clearly defined career paths, in-house education programs, and strong mentoring programs, among others - can help to address and alleviate these difficulties. Ultimately, though, it may be clients, more than organized outreach and retention efforts, that stimulate the most movement. As clients and large companies become more diverse and global, the workforce on the agency side will be pushed to reflect those organizations, survey respondents report. And not just in terms of ethnic diversity, but from a cultural perspective, as well. "It's up to the leadership of an agency to say this is where we need to start focusing to remain competitive five years from now, even two years from now," says David Kassnoff, manager of community affairs and former manager of communications for global diversity at Rochester, NY-based Eastman Kodak Company. While he acknowledges there could be improvement on the corporate side, as well, Kassnoff says, "There is a need for diversity competency at the agency level." Kassnoff says that when Kodak "found ourselves looking for expertise with diverse constituencies without going to a specialty agency... very often, we struggled to find that diversity competency." Kassnoff says employee diversity and inclusion is a fundamental part of Kodak culture. That began more than a century ago, when company founder George Eastman made significant donations to what are now HBCUs; today, Kodak CEO Antonio Perez chairs the Diversity Best Practices CEO Leadership Initiative. "We have found that when we tap the creativity of people who think differently, you get innovation," reports Kassnoff. In addition, he says, diversity within the communications industry is becoming ever more critical in efforts "to reflect the needs, values, and attitudes of the people we're trying to reach." As more consumers take to the Web, "they're going to want to speak in their native voices - and those may not always be the ones PR people are used to speaking in," Kassnoff says. "Diversity competency [will] serve them at least as well as technology competency." For McDonald's too, understanding the value of diversity and inclusion "goes beyond just the right thing to do. It's about our business and what we stand for," says Pat Harris, VP and chief diversity officer. From a PR standpoint, a diverse workforce also equals "a tremendous competitive advantage," says Danya Proud, senior manager of US media relations. Effective communications across all of McDonald's audiences, she adds, means more than "just taking general consumer-market messages and translating them." It also involves understanding the sensibilities - and sensitivities - of each specific market. To that end, Proud says, McDonald's US communications team is "a very diverse group by design... [that ensures] we communicate to the best of our ability." Retaining and nurturing that diverse team is "everybody's business at McDonald's," Harris adds. "We rely on everyone within the system to make diversity real." To achieve that, the company offers continuous education workshops and seminars centered on "communication between men and women, sexual orientation in the workplace, and specifically targeted career development" to employees at all levels, from local restaurant managers to corporate directors. In addition, McDonald's supports volunteer regional and national employee networks, Harris says, for women, Hispanic, African-American, Asian-American, and LGBT employees, among other diverse groups. Such efforts give PR pros hope for the future of the industry and show that while the going may be slow, diversification is happening. According to this year's survey, however, more needs to be done to encourage and promote workplace diversity overall. It shows that 58.3% of agency executives and 44.1% of those in corporate communications are still not satisfied with the level of ethnic diversity represented in their current staffs. That means the industry must make a renewed commitment to take action, from the top down. Until that truly happens, Sachs says, "We're not anywhere close to the tipping point." The PRWeek/Hill & Knowlton survey on diversity in the workplace was conducted by PRWeek and Millward Brown. E-mail notification was sent to approximately 4,137 PR and corporate pros and a total of 250 executives (139 from PR firms and 111 from corporations) completed the survey online between October 11-November 1, 2007. Results aren't weighted. Full results, offering some additional data, are available in Excel format for $150. Please contact Irene.chang@prweek.com .